How to organize, customize and get the most out of Outlook. 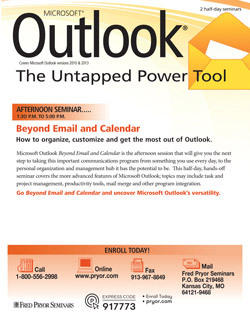 Microsoft Outlook: Beyond Email and Calendar is the afternoon session that will give you the next step to taking this important program from something you use every day, to your own personal organizational and management tool it has the potential to be. This half-day, hands-off seminar covers the more advanced features of Microsoft Outlook; topics may include task and project management, productivity tools, mail merge and other program integration. Microsoft® Outlook® gives us the ability to streamline and organize our busy lives with a collection of key productivity tools. Sometimes, communications can be daunting. It seems the more we are connected, the more complicated it can become. 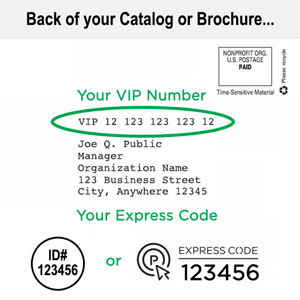 It can even feel that there is more to keep track of as your business and personal communications needs grow. We have meetings, luncheons, appointments at work and things to take care of at home. The more we do, the more we need organizational assistance to help us balance it all. While Microsoft Outlook is not the answer to a balanced life, it certainly is the answer to organizing the chaos that comes with a busy schedule. Use and create email forms – imagine the time you can save with form letters right at your fingertips!